Greek Yogurt, fruit, and granola might be one of your go-to healthy breakfasts, but you’ve never seen it like this before. We’ve transformed these elements into ingredients for a cafe-worthy coffee cake with yogurt and fruit mixed right into the batter. Instead of using sour cream or buttermilk as in most coffee cakes, this recipe instead uses thick and tangy vanilla-flavored Greek yogurt (which just so happens to be fat-free) to keep the cake moist. Instead of a traditional topping, we’ve repurposed protein-packed store-bought granola into a crumbly streusel with cinnamon, ginger, and brown sugar. The secret to keeping this cake light and fluffy is to put the machines aside and instead use a handheld spatula to gently fold the ingredients together until just combined. And, although fresh berries are notorious for sinking to the bottom of baked goods, we relied on this old trick to keep the strawberries suspended in the batter. 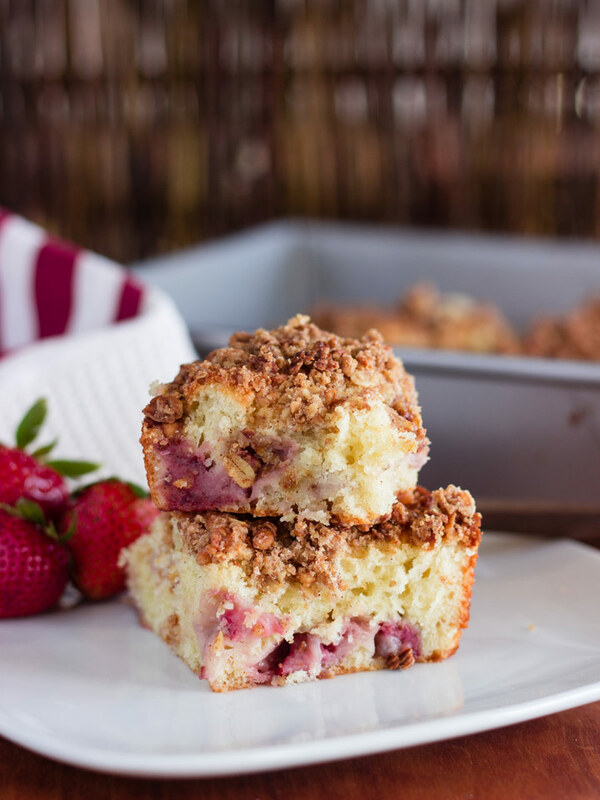 The result is a bright, light, and delicious coffee cake for spring. Pour yourself a cup of coffee, grab the weekend paper, and cut yourself a big slice of this cake. Then, tell everyone else you ate yogurt and granola. We won’t tell. Preheat the oven to 350 F. Butter a 9-inch square baking pan. Make the streusel: combine all of the streusel ingredients except for the butter and mix thoroughly. Add the cubed butter and work together, rubbing the butter in the oats mixture until you have pea-sized pieces of butter. You can also use a pastry cutter or a food processor. Refrigerate until ready to use. In a bowl, sift together the 1 ¼ cups flour, baking powder, baking soda, and salt. Using a stand mixer or electric hand mixer, cream together the butter, granulated sugar, and dark brown sugar until light, fluffy, and creamy. Add the 2 eggs and vanilla extract and mix until just combined. With a spatula, gently fold in the Greek yogurt. Then, fold in the dry ingredients until just combined. In a separate bowl, toss together the strawberries with the remaining 1 tablespoon of flour. Add to the batter and fold in gently. Pour the batter into the prepared pan. Top with the streusel mixture and bake at 350 F for 45 minutes, rotating halfway through, until an inserted toothpick comes out clean. Cool completely, slice, and serve. Hi! Great Recipe I’m bout to make Do you think I can use regular yoghurt, though? Hi Micaela! For this recipe, you really do need to use a thick Greek-style yogurt. Regular yogurt is too watery, which will make the cake come out incorrectly. Also, you can “DIY” your own greek yogurt by hanging regular yogurt in some cheesecloth overnight and letting it drain.